1. How can I tell what version of DirectX I have installed? Windows 8 comes with DirectX 11. 2. Where can I get the latest version of DirectX? If a new update of DirectX comes out you can download the new update from Windows Updates. It is recommended to create a restore point before upgrading DirectX as it cannot be directly uninstalled. The History of DirectX is available on Wikipedia. To upgrade to v12 you need to upgrade to Windows 10. 3. How do I uninstall DirectX? You need to use System Restore to go back to a state before you updated DirectX. 4. How do I get games to work in a Limited User account, they work ok as administrator? You can also use the Security tab on folder properties to apply Read,Write,Modify permissions for the program folder in question for a given user or group (such as Everyone or Users). Windows 8 uses a feature called Virtualize file and registry settings which is enabled and redirects any read/writes to a special folder in c:\Users\username\Appdata that reflects the folder in C:\Windows or C:\Program files and thus allowing older programs to run on Windows 8. The setting is configured in Local Security Policy. 5. I have some Accessories or Games missing. How do I install them? Open Control Panel, Programs and click on Turn Windows Features on or off. Here you can tick a box or enable the components or un-tick the box to disable a component. Games can be found under 'Games' on the Start menu. 6. When I install and run a game it says that it cannot find OpenGL? You need to install the latest drivers for your graphics Card as the one supplied with Windows will only support DirectX. If you have a very old graphics card such as Intel or Sis or S3 graphics chipsets, you may need to replace it with the latest Nvidea Geforce or ATI Radeon cards to run the latest games, as your old card is no longer supported. See OpenGL website for more info on this technology. 7. If I install a game and it asks to install an older version of DirectX, should I install it? Yes, even though Windows 8 already comes with DirectX 11 and it is advisable that any additional Directx updates are installed for the game to work. If a game demands that a specific version of DirectX is installed, ignore it, use Compatibility Mode for Windows Vista/7 instead. If a game still does not work, then it will not work on Windows 8. You will need to set up a dual boot system with an older version of Windows. 8. When I try to install or run an old game, it asks for Windows Vista or Windows7? Fortunately, Microsoft have had the foresight to add a compatibility mode which is accessible via Start, Programs, Accessories, Program Compatibility Wizard. Run that and follow the prompts to get your program working. 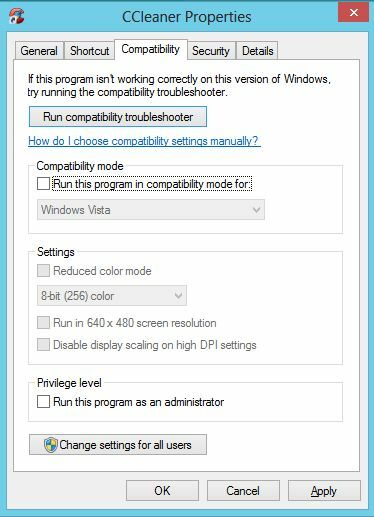 You can also access Compatibility settings via the program's Properties and click on Compatibility tab to set options manually. 9. I want to run an old DOS game, what do I need to do to get it to run? You can also use a third party product called the DOSBox to play DOS games on Windows 8. It can create the correct DOS environment to play DOS games. 10. How do I test my DirectX or OpenGL drivers are working? 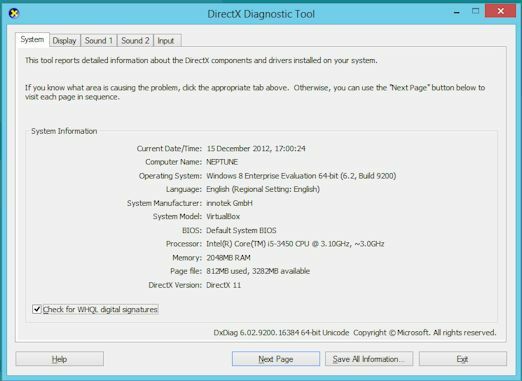 You can run the DXDiag.exe utility to diagnose DirectX problems with Display, Sound and Input devices by clicking on the Display tab. Make sure DirectDraw and Direct3D are enabled. For OpenGL, you need to download third party software to test GL software and drivers. Try the OpenGL Extensions Viewer from RealTek. For graphics card information try GPU-Z. 11. I cannot install or run a new game and I have latest DirectX? You need to check the requirements for the game. Some new games require the latest and fastest graphics card for the game to work. Built in graphics chipsets such as SiS or Intel Extreme or older graphics cards such as Voodoo, ATI Rage or Geforce 2 may be too old and will only use a subset of DirectX features.Replacing the card with a newer card such as a ATI Radeon or latest Geforce. 12. Where can I get the latest graphics card drivers? First try the manufacturer's web pages as they will have their own driver sets. Otherwise try AMD, Sapphire Tech, NVidea, or even Driver Guide. 13. How can I tell how capable my Graphics Card is and which DirectX version it supports? Most modern PCI Express graphics cards now support DirectX 9 since 2002. Laptops tend to use older and slower graphics chipsets and will not have as much memory or features as their bigger brothers on PCI Express cards. Check on manufacturer's website for details. Run DxDiag, and check the Display settings or use GPU-Z tool. 14. What sound options can a PC have? Most PCs now have built in sound chips for producing music and sound, they can be adequate for most users but for better sound, you need a discreet sound card for higher quality sound such as the Creative range. The type of speakers you have also helps which can range from Mono (single speaker), Stereo (two speakers), 2.1 speakers (2 high, 1 bass), 5.1 speakers (Surround sound) and 7.1 speakers (surround sound with 2 more speakers). 15. Where can I get the DirectX Software Development Kit? You can download the latest SDK from Microsoft Downloads. 16. What is T&L support in a graphics card? 17. What is Pixel Shader support in a graphics card? 18. How do I test FPS (Frames per second)? A lot of high end games such as Doom 3, Half Life 2, Call of Duty and so on, have a built in developer console (enabled in the game options). * Call of Duty 4: cg_drawftp number (where number is 1 2 or 3). * Half Life 2: cl_showfps number (where number is 0,1 or 2). * Doom 3: timedemo demo2 or set com_showFTP "1"
19. Is there a simpler way of accessing graphics, audio and input devices? Yes, there is the Simple DirectMedia Layer (SDL) which is a free library for use with languages such as C++, C# and Python. You can read about it and download it from LibSDL.org.